We are extremely proud to announce that Sneck Lifter has won this prestigious award. Sneck Lifter is one of the Brewery’s flagship beers and this award enhances the beer as a true stand out champion. Sneck Lifter was entered, and then went on to win the North West Regional heats last year, in the Old Ales and Strong Mild Category, taking the beer to the finals which took place on the opening day of the Great British Winter Beer Festival in Norwich. 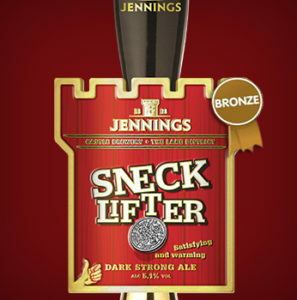 Jeremy Pettman – Head Brewery at Jennings Brewery said: “We are absolutely delighted that Sneck Lifter has won the award! The ale was originally brought out as a seasonal winter warmer in 1990, it proved to be so popular that it became a permanent ale in our portfolio in 1995. Jennings Brewery is celebrating its 190th year of brewing this year and this award goes to highlight why we are such a long established brewery, producing quality cask ales”.